Note: This post was written March 12, and posting was delayed until our return home. This is the first part of our trip: driving from Kansas to Indiana with Jacob and Oliver. From Indiana, we’ll be flying to Germany while the boys stay with their grandparents. We normally don’t like long road trips. Our preferred way to travel is by train. By air is second, and car is last. But this time, driving was all that made sense. We planned to make the 11-hour drive in two days to give the boys more of a chance to get out of the car and run around. It’s always a bit demoralizing heading east from our place. You drive at highway speeds for an hour and are barely one county over. We left at about noon and made it as far as Kansas City before our first stop — much to our surprise. 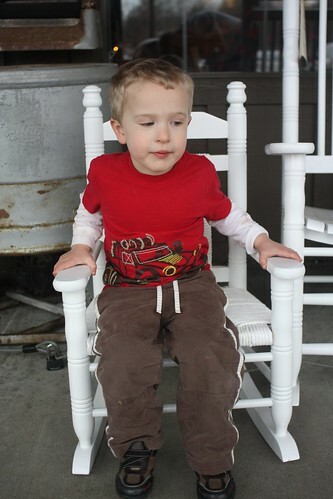 We ate at a Cracker Barrel there. 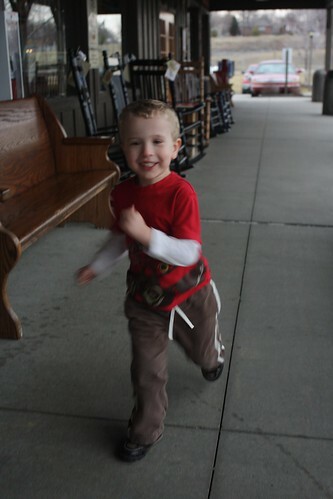 Afterwords, Jacob loved running in front of the restaurant. 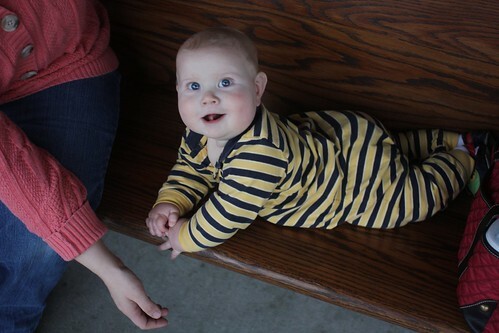 Meanwhile, Oliver chilled on a wooden bench. We spent the night in a hotel on the eastern edge of the metro area. Then Thursday hit the road again. We stopped for a mid-morning snack, then ate lunch at Pizza Hut. Jacob ran around in the grass outside again. We had a few toy-throwing episodes, but overall Jacob did very well. Oliver did even better. He slept a good part of the way, and happily watched Jacob for most of the rest. The car trip went well. This morning, it’s time to get ready to head to the airport, and to break the news to Jacob that we’ll be gone for a few days. We’ve learned that he worries a lot about change if he knows about it too much in advance, finding it hard to process and understand, so we’ll tell him after he wakes up this morning. Then off to the airport for our flight to Newark. Then we get to sit around in New Jersey for a few hours before our 7.5-hour flight to Hamburg.